You may remember me saying that we are going to build ourselves a home. In the Cotswolds, on the edge of a lake. First things first – we have given the house a name – Rainshore. This is the name my Grandfather gave to the house he built in 1929. The house was passed to my brother who sold it eventually, so this is a way of reinstating it, and remembering my father and his family home. I mentioned work would start in six weeks. However the design development has taken a little longer than we hoped. And now it needs to be agreed by the Planning Department, so building won’t start until October, or maybe later. But not to worry. We have spent the time really working carefully on every aspects of the plan. Want to see what we are going to build? I read a lot of plans because my job involves the construction of homes. It is just like “reading” a dress pattern. You have to know some of the symbols, but mostly you have to have a sense of scale, proportion and the ability to construct a 3D view in your imagination. This is not a huge home – it has four “bedrooms” on two floors. It doesn’t have a traditional garden (the open space is communal and very extensive), but it has a roof garden. Or at least an accessible flat roof big enough to eat out on, and sunbathe too. It is basically a modern design, a bit like a shipping container (which are used for homeless people sometimes). It overlooks a lake and is south facing, so as good as it get in UK terms, making the most of the 26 nice sunny days we get each year. Starting from the left on the ground floor, we enter with a bedroom to our left. This (like most of the rooms) has sliding doors so that it can be left open to give a sense of space, and closed when visitors come to stay. In addition the bed (like most of the beds) is a swivel/pull down bed so that all the rooms are multi-purpose. We can use the rooms for our hobbies. This one is for my husband. It has an ensuite bathroom, and the staircase next to it. The next bedroom will have pull down bunks for children who come to stay. But it is also the laundry and utility room. At the front of the house on the ground floor, overlooking the lake is our bedroom, with alot of glazing and a door to the outside, and a terrace for sitting out on. The drawing in the middle is of the first floor. At the top of the stairs to the left is another room which can double as a guest bedroom. But this will be my sewing room! It has a pulldown bed, but also cupboards for storing materials. Although it is north facing it has a balcony with a door to provide lots of light and the chance to go out for a bit of the fresh air. The sliding doors to the living room would normally be retracted. There is a toilet and basin nearby so that visitors would not have to go downstairs if they were staying up here, except for a bath or shower. We are just trying to see if we can get a shower in here too. The large space is our kitchen-living-dining room. I expect to cut out my sewing projects on the large dining table which is of an ingenious design (more of this later). There is a large outdoor balcony area ideally situated (as they say in estate agents brochures) for outdoor dining and staring at the lake. We wanted the living room on the upper floor to give us the opportunity to look out at the lake and the wildlife. Although there is underfloor heating and the house will be very eco-friendly, we have specified a wood burning stove in the sitting room. Although it may never be needed in terms of temperature, we like to see wood burning – it is a lovely feature. The stairway leads up on to the roof in the third picture. We will probably plant some bushes to give privacy and shade. Nick is considering a camomile lawn. But in the end I think we will probably have wood. So far, so good. There are a few more changes yet, but we are close to signing off the plans. I will give you another update fairly soon. 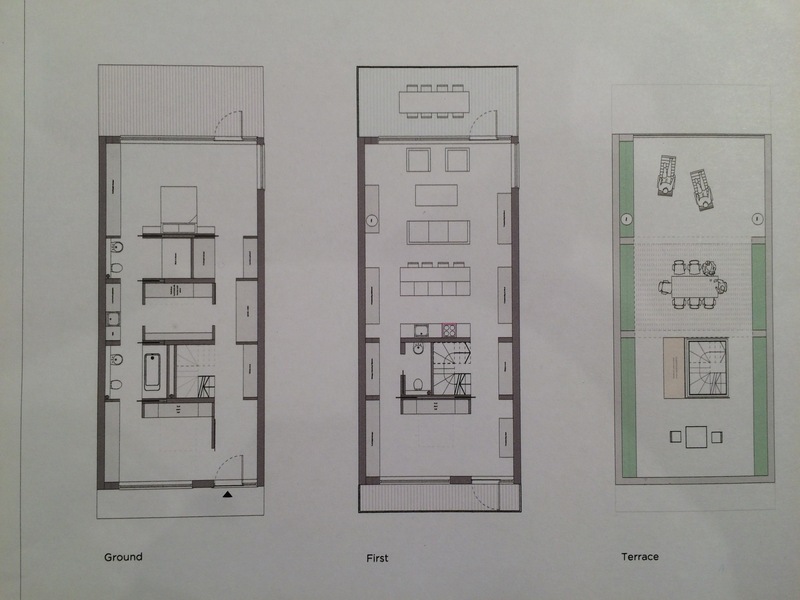 We hope to specify what the interiors will look like before we start on site. I can imagine this coming to fruition – a lovely and efficient use of space. What an exciting project! Well thought out design. Can’t wait to see it happening. The terrace overlooking the lake and green spaces would be my favourite place, even in the winter. Exciting, looking forward to hearing more about this. What an ingenious and beautiful use of space- as should be expected of course! I can visualise it already, and look forward to seeing this project grow. How very very exciting, Dawn is jealous! Kate, How exciting! Your plans seem well thought out. Love the concepts of the Murphy beds, sliding doors, and balcony. Looking forward to seeing more plans, especially the overall look of the modern design. I love home design. We do homes somewhat differently in Canada, so I’m wondering if there’s a bylaw preventing you from having more side windows? This is a detached house, correct? What are the dimensions? Does the entrance to the rooftop terrace allow any light in and down? Very good question F. There is significant light from both ends and from the roof light over the stair well. There are windows at the side on the ground floor. The house is detached but there are neighbouring properties so at the moment we are thinking no side windows on the first floor. But we haven’t made a final decision on that. Personally I think you’d regret having no side windows on the first floor. Windows not only provide light and air, they also provide the illusion of space. One day you’ll feel trapped in a tunnel in the middle of that long, narrow structure, maybe after 30 days of dreary rain 🙂 That won’t happen if there’s a side window, even if you have sheers, or drapes, or blinds over the window. I don’t need to remind you that windows provide a wonderful opportunity to showcase fabulous fabrics. You also could consider something other than a standard window. How about stained glass? Or those windows in which the glass is textured? Or a half-round window set a little too high to see out of? Or even a long narrow window set horizontally high on the wall. You can also hang glass balls, shards of glass, or even a stained glass window from the frame of the window to play with light and colour. There are so many options if you go with a window, but a wall is a wall is a wall. Ok, that’s it from me; I’m sure whatever you choose will be what’s best for you 🙂 Have fun. Thanks so much for this thoughtful advice Felicia. This will be a lovely house for you and Nick. It looks well thought out with lots of built ins. How wonderful to be able to make a house to precisely your requirements. I am sure this home will be wonderful. We built our house three years ago – I would urge you to rethink having underfloor heating in bedroom spaces – it is way too warm and takes ages to respond to shifts in temperature. We find that the heat is trapped under the bed space and heats the bed and it’s occupants up to an uncomfortable degree. It is about the only thing we would change if we were to build again. And make a written/recorded note of every conversation you have with your builder – they have notoriously bad memory’s as we found out to our cost. Good luck – it is very exciting when it all comes together and it looks like a fabulous house! Thank you Claire. Which country are you in please? Your plans sound lovely and you have the experience and vision to know what space you want and how it will be used. No doubt about it, leaving it to return to the rat race will not be easy. Exciting. Will the house have a Maypole?